Manchester City never does it the easy way. Despite being the best side in the league during their two Premier League triumphs this decade, the boys from the Etihad have stumbled across the finishing line opposed to cruising to silverware like the great teams before them. During Roberto Mancini’s tenure, City benefitted from United’s slip-ups against Wigan and Everton, before Edin Dzeko and Sergio Aguero scored stoppage time goals to defeat relegation battling QPR to win the Premier League in the most controversial manner. Then in the latter stages of last season –– despite only being top of the league for 14 days of the season –– after a crushing defeat at Anfield against Liverpool, Chelsea and Crystal Palace subsequently took points off the Reds that led to another late revival in May. However, lodged between City’s narrow title triumphs was a disappointing season that saw a considerably frail Manchester United side top their rivals by 11 points to reclaim the league title. City’s attempt to build a dynasty failed miserably, and their poor activity in the transfer market played a significant factor. Mancini didn’t get the required pieces –– Javi Martinez, Robin van Persie, Daniele De Rossi and Eden Hazard –– and was handed Jack Rodwell, Scott Sinclair, Javi Garcia, Maicon and Matija Nastasic, with only the latter featuring regularly in the starting XI. City had only won the league on goal difference, which explains why the signing of a legitimate world-class striker in van Persie catapulted United back to glory, while City’s development stagnated. The arrival of Manuel Pellegrini saw City recruit experienced players around the continent –– Jesus Navas, Alvaro Negredo, Fernandinho and Stevan Jovetic –– to fill the voids within their squad, but winning the title on the final day of the season against rivals that were in transitional periods calls for improvement. However, City’s transfer activity this summer has been limited due to their Financial Fair Play irregularities. While Diego Costa, Ander Herrera, and Alexis Sanchez have joined their title rivals, City has introduced Fernando, Willy Caballero, Bacary Sagna and Frank Lampard on-loan, with Porto centre-back Eliaquim Mangala expected to join the reigning champions. Pellegrini’s squad doesn’t need major changes, but increased quality would not only separate City from those attempting to make a title push, but increase their chances of competing against Europe’s elite in the Champions League. Sagna and Caballero provide adequate cover and increase competition for Pablo Zabaleta and Joe Hart, while Lampard’s arrival is merely a wise ploy to keep him fit ahead of New York City FC’s inaugural season and meet the required five home-grown player quota in the Champions League. This leaves £12m Fernando as City’s sole significant purchase, with the champions finally replacing the tenacious Nigel de Jong. Fernando is a quality footballer that can sit at the base of the midfield and break up play with his physicality and positional intelligence, while Fernandinho and Yaya Toure offer attacking impetus in central areas. His signing also offers Pellegrini flexibility to stray away from his preferred 4-4-2 and potentially dabble with a 4-3-3 and 4-2-3-1 in big games. Fernando’s arrival is significant because with Yaya Toure turning 31-years-old last May, Pellegrini will be eager to deploy the Ivorian higher up the pitch and decrease his defensive duties. City’s midfield remains their strong point with a veteran core of players, led by the impeccable David Silva. 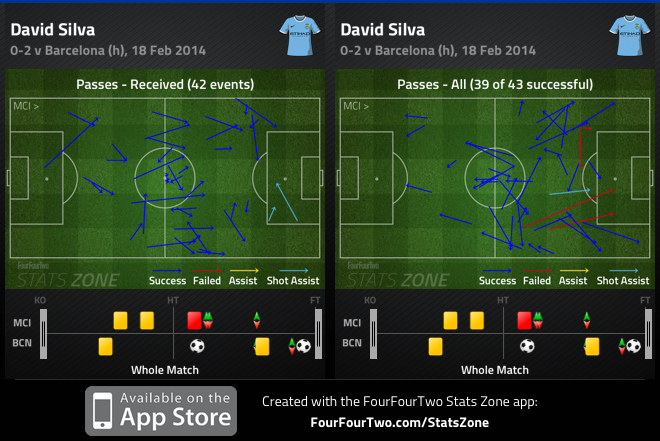 Toure’s 20 goals received plaudits last year, but Silva was their best player. Look no further than Silva’s standout performances against the best sides in the Premier League last season. Silva constantly found spaces between the lines to provide delicate through-balls to his teammates, while his willingness to drift laterally from flank-to-flank to create overloads played a significant role in City’s dominance on the left side of the pitch. Silva’s goal or assist tally don’t represent his overall excellence, as he’s usually the catalyst in City’s best moves, averaging a league high 3.6 key passes and 0.6 accurate through-balls per game. Pellegrini’s midfield should suffice for another season, but the main worry for City lies both in defence and attack. The fullback positions appear to be solidified, but it’s the centre-back area that looks particularly feeble. Vincent Kompany has declined significantly since City’s first title triumph, and like partner Martin Demichelis –– who will turn 34 next season –– is extremely vulnerable when positioned higher up the pitch. City has desperately required a top-class defender alongside Kompany over the past few seasons, and while Mangala has the potential to become an elite European centre-back, his arrival doesn’t guarantee immediate defensive solidity. The one positive Pellegrini can take from preseason –– along with no injuries sustained or issues within the locker room –– is the form of Jovetic. City operated in a 4-4-2 throughout their USA tour, with Jovetic forming an imperious strike force with Dzeko. Jovetic scored five goals at the Guinness International Champions Cup, but more impressive was his overall linkup play. Jovetic operated behind the main striker and dropped deep to link play with the midfield, his various strike partners, and created space for runners to exploit. Nonetheless, there was never an issue regarding the quality of City’s attacking quartet. Pellegrini’s main concern was in regards to their fitness levels. With Alvaro Negredo sidelined for approximately two months with a broken foot, along with Sergio Aguero and Jovetic’s recurring injuries, only Dzeko serves as a reliable option. Aguero, in particular, was stellar last season scoring 32 goals in 36 appearances in all competitions, despite suffering numerous injuries. Aguero scored against every side in the top seven excluding Liverpool –– he was sidelined for the home fixture, and played a bit part role in the return showdown at Anfield after returning from injury –– further exemplifying his importance to City’s title challenge. When available, Aguero is undoubtedly the best striker in the league, and his fitness plays a significant factor in City’s title hopes. While no club has retained the Premier League since the turn of the decade, City is equipped to be the first. But with Chelsea adding the missing pieces to their squad, the fitness of City’s strikers and the arrival of a top-class centre-back will play a vital role in whether Pellegrini’s side becomes the third team to retain the Premier League title. City is definitely a more complete side in their second title defence of the decade, but shades of their 2012-2013 season hovers around the Etihad. Samir Nasri’s career outside of France has been reminisicent of an emotional roller coaster. Yet, over the past 12-18 months, the Frenchman has also endured negativity in his homeland. The scene was familiar to Nasri. It was happening again. Nasri, arguably the most vilified footballer on the planet, was held responsible for France’s 1st leg World Cup playoff loss to Ukraine, in Kiev. The media was unimpressed with Les Bleus’ performance, and they shared their disgust in French newspaper L’Equipe. Whilst the French paper referred to the display as ‘the worst ever’, a nightmare, and a black evening to forget, the player rating the Manchester City midfielder received was mind-blowing. A team low three out of ten – shared with Eric Abidal and Laurent Koscielny – was harshly awarded to Nasri, and it led to his inclusion on the bench in the return leg. Nasri’s role as France’s main creator behind the attacking three was peculiar – specifically because the nifty Mathieu Valbuena was left on the bench. Nasri could’ve had a significant impact on the right flank – Loic Remy was anonymous, and Nasri’s presence would provide natural balance, thus handing Valbuena the freedom to link play in the final third. Nasri found himself in deeper positions – the Frenchman drifted yards away from Paul Pogba and Blaise Matuidi to receive the ball and help France push forward as a unit. More so, when he did get into positions near Olivier Giroud, Nasri played clever incisive passes in the final third. The Frenchman received a great chance to equalize late in the second half, but Andriy Pyatov comfortably saved his tame effort. Simply, it wasn’t his night. Relatedly, Nasri is accustomed to hostile reception and criticism. His devilish smile, quirky hairstyle and individualistic aspirations have tarnished his once admired demeanour. Equally, he’s a player that’s easy to despise – some would go as far as saying he’s a player you’d want to punch, but this doesn’t faze the 27-year-old midfielder. Pressure and heavy criticism was a formality growing up in Marseille. Nasri stated that the city would mourn a Marseille loss, and frequent visits from the director of football, and president of the club were normal. The former Marseille ball boy also had to deal with comparisons to Zinedine Zidane during his youth career. “It drove me mad. When you’re 17 years old, you don’t play well every week. You can imagine what it was like to be compared to the best player the world has seen in recent years, “ Nasri said in an interview with FourFourTwo Magazine. However, there’s been a significant change in Nasri’s game. In the past, an international disappointment of this stature would hamper the Frenchman’s overall game, but the atmosphere around the blue side of Manchester is different. Nasri’s enjoying one of the better seasons in his career, and the contrast in performances compared to last season is evident. Nasri labeled last season the worst of his career. The Frenchman never fully recovered from the controversy that occurred at Euro 2012 – mentally, and emotionally he was in a dark place. “In my head I wasn’t the same. I didn’t play well for City and lost my spot in the squad and at the end of the year, you look at your season and you realize I was not myself,” Nasri said. The Frenchman couldn’t stay out of the media, and they heavily scrutinized his poor performances and lack of interest on the field. Likewise, former City manager Roberto Mancini’s comments weren’t beneficial to Nasri’s form. In the past the Italian manager publicly questioned Nasri’s work ethic and stated his desire to punch the Manchester City midfielder – simply because of his inconsistent form – which left the Frenchman displeased. “Managers have different ways of working, some like to say things in the press to make players react and some like to say things face to face with the player. Some players see things in the press, it touches their ego and they react,” Nasri said. Nevertheless, Manchester City has looked a rejuvenated side this season – albeit they still struggle to obtain maximum points on the road. But their results at home and in Europe have improved vastly, and Nasri’s inclusion in the squad is a significant factor. His form, swagger and confidence are back. The Frenchman’s nonchalant movement around the final third, along with Jesus Navas’ wide positioning has provided balance in the City attack. The flair and trickery of the past bewilders defenders, his forward runs into the box are being translated into goals, and his precise, incisive final balls have created several top-class goals. Both of Nasri’s goals for City this season were in blowouts at home against Newcastle and Manchester United. The Frenchman reacted quicker than Davide Santon, and pounced on a loose ball, which sent him free on goal, and he fired his shot past Tim Krul. Whereas against United, he made a 60+ yard run, slyly drifted towards the back post and side-footed an exceptional Navas cross past David De Gea. 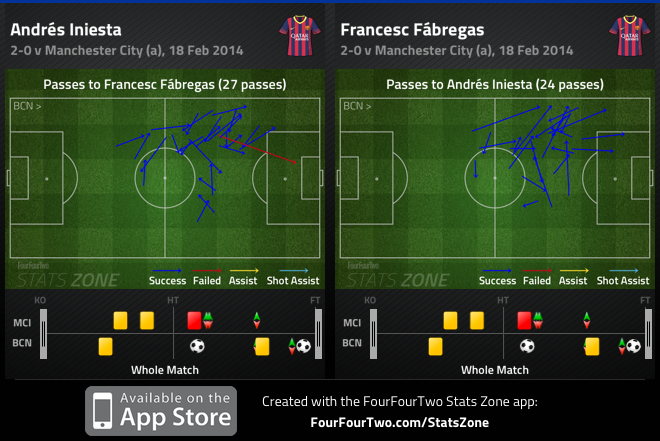 Equally, Nasri’s passing has been proficient this season. He tends to drift into central positions to help City sustain possession, but also to create a numerical advantage in midfield. This season alone he’s provided two magnificent final passes to Sergio Aguero that allowed the Argentine to showcase his prolific finishing. Also, as good as Nasri is going forward, the Frenchman doesn’t ignore his defensive duties, and has provided remarkable cover for his fullbacks, when needed. Statistically, Nasri has been impressive. According to whoscored.com, the Frenchman currently maintains a 90% passing rate – in both the Premier League and Champions League – and completes 2.3 key passes per game domestically. Only Angel Di Maria has recorded more assists than Nasri’s four in the Champions League, while his 3.2 key passes per game is only bettered by Nico Gaitan, Juan Mata and Franck Ribery. Nasri’s revival at Manchester City has been positive, and the Frenchman believes Manuel Pellegrini has played an integral role under his return to prominence. “What is different between him and the other manager is he is really present in the training. He stops it when something is wrong and that is interesting for us because he wants us to play with principles and to understand,” Nasri said. The Frenchman has highlighted a similarity between Pellegrini and his former manager Arsene Wenger’s work ethic and man-management skills. “He [Pellegrini] is someone who talks with the players and it is good for the players to know exactly what he is doing right or wrong. What I like about him is he also talks about everything outside football, to know how you are in your life and it is pretty important for a manager to know these things,” Nasri said. Nonetheless, Nasri is a player that relies on support and guidance from his manager. The Frenchman arguably spent the best moments of his career – thus far – at Arsenal, and he looks capable of surpassing that level at the moment. 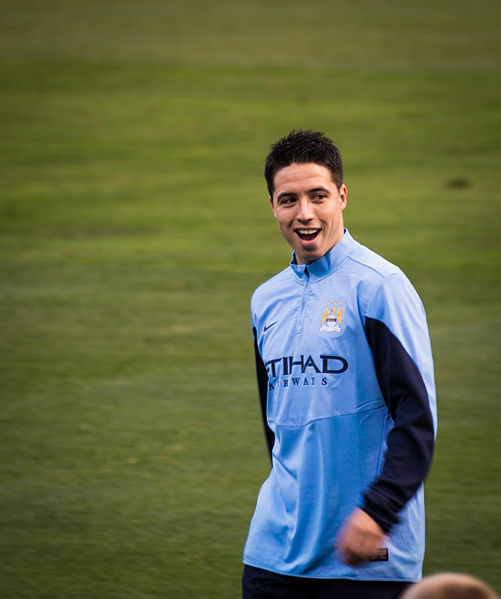 “I suppose the best Nasri will come in the future – he has a lot more where he can improve,” Pellegrini said. Those words indicate belief in Nasri, but it also demands improvement. Nasri is enjoying the best moments of his domestic career since leaving the Emirates in 2011, and has become an integral piece to City’s title contending puzzle. The skill, talent, experience and work rate were always present, but Pellegrini is looking to add one more element to Nasri’s game that will merit him as a top-class player. Manchester City thrashed rivals Manchester United at the Ethiad Stadium. David Moyes made two changes to the side that defeated Bayer Leverkusen midweek. Danny Welbeck led the line in a 4-4-1-1 with Wayne Rooney positioned behind him. Ashley Young was also included in the starting eleven, pushing Shinji Kagawa to the bench. Robin van Persie was excluded from Moyes’ eleven due to a thigh injury he suffered earlier in the week. Manuel Pellegrini made one change to the side that comfortably dispatched of Viktoria Plzen in the Champions League, as Alvaro Negredo pushed Edin Dzeko to the bench. Negredo led the line in a 4-2-3-1, ahead of Sergio Aguero, Samir Nasri and Jesus Navas. 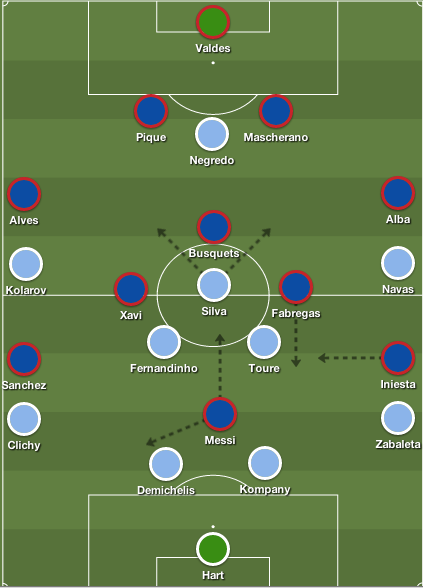 Yaya Toure and Fernandinho formed the double-pivot, while Vincent Kompany and Nemanja Nastasic formed a centre back duo. City blitzed United from the opening whistle, displaying superiority over their rivals all over the pitch, as United produced a diabolical performance. City’s dominance in the opening 20 minutes of the match was down to hunger and determination, but also due to United’s shape without the ball. Moyes’ men dropped off into two banks of four and allowed City’s double-pivot space to play positive passes and drive forward. Valencia sat narrow, Carrick and Fellaini tried to stay compact, whereas Young was in a wider position – as they aimed to minimize pockets of space and movement between the lines. Unfortunately for Moyes, City’s intricate passing and space to push forward, allowed Pellegrini’s men to assert their dominance on the match. 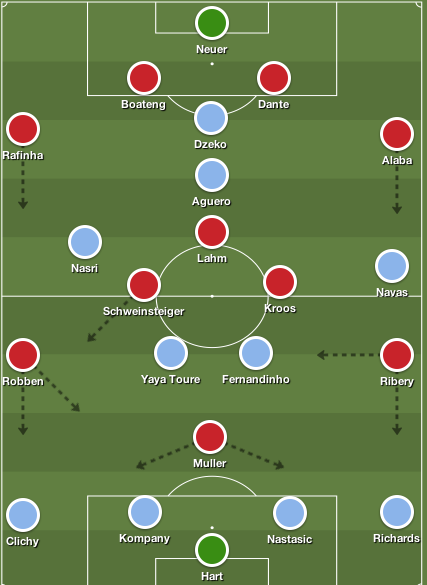 Aguero was dropping into pockets of space to hold up the ball and link play with the midfield, while Toure pushed forward providing an attacking thrust in advanced positions. However, United did enjoy a fair amount of possession throughout the match, which saw City also drop into two banks of four – the difference being City’s compact shape and their wide men dropping deep to protect their fullbacks. United’s shape allowed City to dictate the tempo of the match – Moyes’ cautious approach in big matches was evident, but his idea to soak up pressure at the Ethiad was absurd. 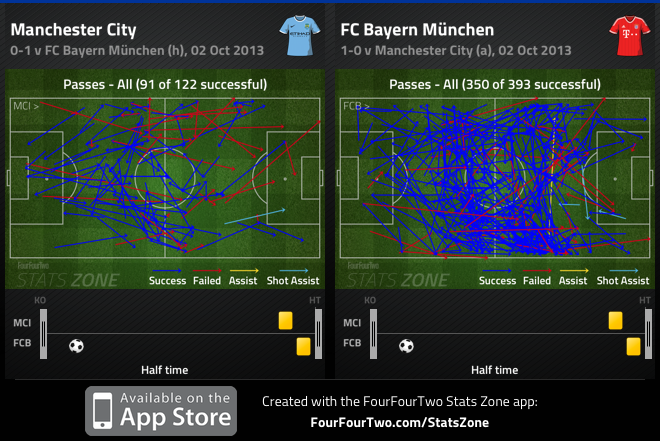 A consistent theme throughout the match was the enjoyment City had on the left flank. City possessed two full backs that enjoy getting forward in Aleksandar Kolarov and Pablo Zabaleta, which is why Moyes’ decision to drop Kagawa was logical – here he fielded two wingers that he felt were disciplined enough to protect their fullbacks, but could provide width and pace on the counter attack. Surprisingly, United failed to dominate an area that they expected to cope with. Young did a great job defensively in keeping Pablo Zabaleta quiet, as the Argentinian fullback didn’t have a significant influence going forward. But despite Young’s efficient defensive work on Zabaleta, the English winger was lethargic in attack, often providing poor crosses into the box and conceding possession. Valencia enjoyed a great outing against Leverkusen mid week, and based on past experiences he’s a key cog for United in big matches, but the Ecuadorian was the weak link in the opening 30 minutes. Nasri picked up narrow positions to help sustain possession and Smalling stuck to him, thus leaving ample amount of space for Kolarov to attack. There were four occasions which Kolarov got forward freely with Valencia failing to track the Serbian fullbacks run. 1) In the 10th minute Kolarov surged forward and provided a devastating cross that Nemanja Vidic cleared for a corner. 2) Minutes later, the Serbian repeated the same run, but his delivery went over the head of the on-rushing Navas, who was able to control the cross and maintain possession. 3) Aguero’s opener in the 16th minute was down to Nasri’s ability to hold up the ball on the left flank, allowing Kolarov to attack the space behind him to receive his pass, and play in a terrific ball for the Argentine striker. 4) Seven minutes later, Kolarov got the better of Valencia again, but he lost control of the ball, and made a comical appeal for a penalty. In the span of 23 minutes, Kolarov attacked the space behind Smalling four times, and this was a key component to City’s attack in the first half. Welbeck and Rooney looked bright earlier in the match prior to City’s dominance, as they were finding space between the lines to receive the ball. Fernandinho and Kompany did a great job in containing the English striker at certain moments throughout the match, but Rooney worked hard to get into key areas to link play with his teammates. 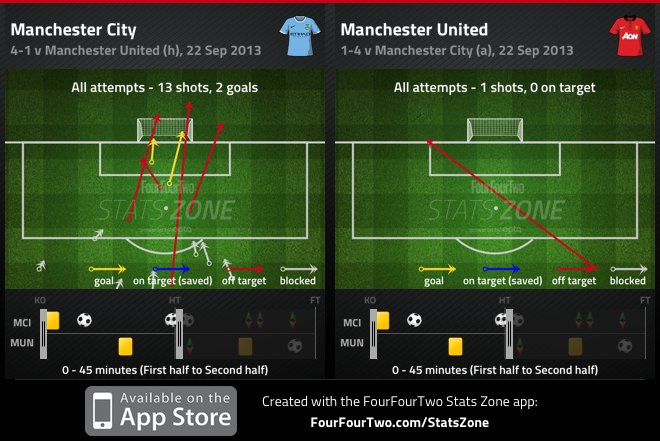 City’s energy levels dropped minutes after Kolarov’s cry for a penalty, and United began to enjoy more possession. Yet, United didn’t create any legitimate goal-scoring opportunities and failed to get behind the City backline. There’s been a recurring theme in United’s matches against the top sides thus far, where their passing tempo is slow, penetration is non-existent and the link between midfield and attack is disappointing. Carrick and Fellaini had space to play passes, but they were often sent sideways, opposed to between the lines. 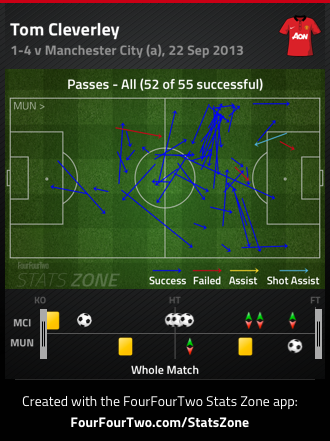 Carrick’s passes lacked conviction, while Fellaini was patient with his passing, rarely attempting to play a ball forward. It was a dire first half outing from United going forward, as Rooney was the only player that looked capable of bringing Moyes’ men back into the match. Ultimately, this was when the match escaped United, as they were aiming to take the match to City from the start of the second half. 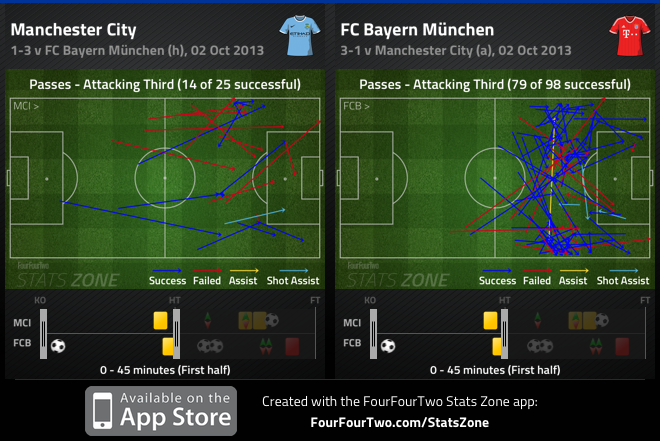 But once again it was the play from City’s left hand side that played a key role in their third goal. Nasri cut in centrally as Kolarov surged forward, but this time United’s right side coped, as Valencia followed Nasri and Smalling stuck with Kolarov. But Nasri played a ball into the box for Negredo, who comfortably turned Nemanja Vidic and squared a ball for Aguero to side-foot past David De Gea. Three minutes later, Kompany broke up play in his third, and played a nice ball to set Navas free. The Spaniard drove forward from his half to the United byline – attacking the space Evra left free – and delivered a well-weighed cross to an oncoming Nasri, who slotted the ball into the net. United were down four goals to City on the road, and with 40 minutes remaining, a City onslaught looked evident, as United was dejected. Moyes was quick to react to a dismal opening five minutes in the second half, as he introduced Tom Cleverley for Young to add numbers in midfield. United were now a 4-3-3 with Welbeck pushing to the left – an approach Moyes could’ve started the match with due to van Persie’s absence, to assure midfield dominance. 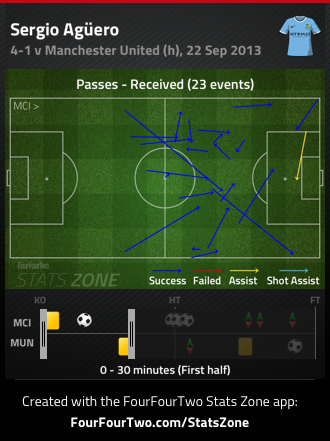 Tom Cleverley completed the match with the third highest amount of successful passes, despite being on the field for 39 minutes. It’s difficult to assess United’s improved display in the second half, because City looked to have taken the pedal off the gas in an attacking sense. Yet United were better in possession due to the extra passing outlet in midfield, and they began to string passes into wide areas for Valencia and Welbeck to run onto. Fellaini still looked lost at the tip of United’s midfield three, while Cleverley provided glimpses of penetration in his passing and forward runs – but with the quality in wide areas poor, but slightly improving and City’s lead stretched to four, it was too big a mountain for the champions to climb. It was always going to be interesting to see how the two marquee summer signings would perform alongside arguably two of the best midfielders in the league, in Carrick and Toure. Both Fellaini and Fernandinho were brought in to bolster midfields that have suffered in Europe, but have also been overrun domestically, and this was the first big test for both men. Fernandinho didn’t have one of the best games of his career, but displayed why City splashed £30m for his services this summer. Despite Rooney receiving space between the lines to receive the ball, the Brazilian did well to disrupt and occasionally dispossess the United striker in the final third. Fernandinho provides Pellegrini with adequate balance in midfield – he’s a reliable passer from deep positions, who sits in front of the back four, allowing Toure to push forward in attack. One of City’s weaknesses in the past has been their vulnerability towards quick counters, but the Brazilian midfielder has played a key role in preventing City from being dragged out of position when pushing men forward. On the other hand, Fellaini’s mental toughness was challenged today, and the Belgian midfielder was futile. Fellaini can be held responsible for City’s second and third goal, where his lapse of concentration left Toure free in the box, along with allowing Aguero to run from midfield to tap in Negredo’s cross. It’s moments of this stature that separate top class players from the rest, and besides his impressive pass rate – solely based on sideways passes that lacked invention – the Belgian endured an unimpressive derby debut. Fernandinho provides City protection, flexibility and balance in midfield, allowing the attacking players more freedom to express themselves, yet the verdict is still out on Fellaini’s arrival – despite his physical presence, a deeper role lessens chances of him making runs into the box from midfield and he’s far from a genuine match-winner. City fans were relieved when they heard Kompany was declared fit to play earlier this week. Last year’s runners-up have been often criticized for looking feeble at the back without their captain, and his inclusion in the squad was influential. The City captain made several vital interceptions and tackles in his third of the field and his defensive work on Rooney was also impressive. Pellegrini’s men looked stable defensively, and were fairly organized for the duration of the match, which is down to the Belgian’s presence at the back. “Maybe the game meant a little bit more to us than to them. We’ve been looking forward to it, our fans have been speaking about it for a long time and we needed to win. We have a fantastic home record and we know there is no reason we should fear the opposition,” Kompany said. 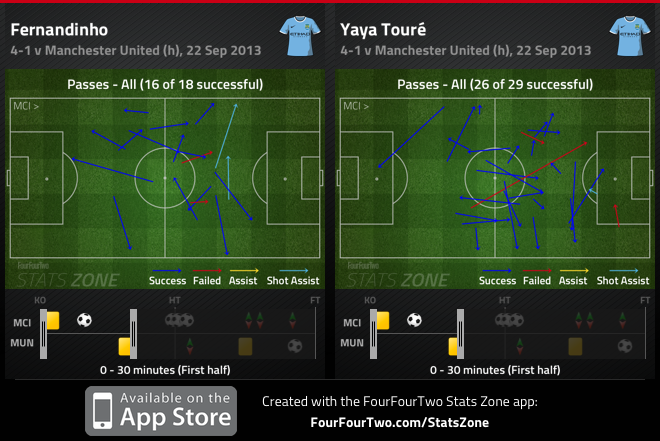 United struggled to pose much of an attacking threat throughout the match, yet when they did, Kompany made the difference. Manchester City dominated United in nearly every aspect possible, and their intent to overload the left flank was pivotal. “We did say it was a difficult start, didn’t we? I said at the time, the way the balls came out of the Premier League bag, I wasn’t convinced… and I’m still not,” Moyes said. It was an inane statement made by the United manager, considering every team faces one another, and other teams – with lesser talent – has endured difficult fixtures as well. Nevertheless, his cautious approach failed, and it was shocking to see Moyes wait so long to make alterations. More importantly, they continue to look dismal going forward, lacking creativity and penetration, and it’s an issue that needs to be sorted out – United hasn’t scored a goal from open play in the Premier League since their win against Swansea and that’s worrying. Pellegrini’s men were hungrier, faster, sharper, and created more chances than United making them worthy winners on the day. Nasri continues to show signs of rediscovering form, while City’s core of Kompany, Toure and Aguero all had terrific outings. “I would be very happy if we win all of the games 4-1 but we must improve every game. Not every game is the same, we are just starting in another way to play and I hope we will improve every day,” Pellegrini said. “Always winning against Manchester United and the way we won could have an important impact,” he added. City’s performance was impressive, and once again it showcases why they’re contenders to claim the Premier League title. It’s flabbergasting to see how fast things can change in the span of a year. At this time last year, Manchester City was preparing for a friendly against Premier League rivals Arsenal, at the Olympic ‘Bird’s Nest’ Stadium, in Beijing. City, fresh off their last-minute title triumph on the final day of the Premier League season, were a class above the Gunner’s on the night. Despite both sides missing several key players on vacation, City vividly reminded those in attendance how they won their first league title in 44 years. City added Maicon, Jack Rodwell, Nemanja Nastasic, Scott Sinclair and Javi Garcia to their squad last summer, relatively all squad players, to a side that won the league on goal-difference – relying on a collapse from their cross-town rivals, which ultimately saved Mancini’s job. Yet expectations were arguably set too high for Mancini’s men, and they failed to deliver, ending the season trophyless – specifically crashing out of the Champions League group-stage and their horrific FA Cup final loss to Wigan. Injuries, training ground bust-ups and Mancini’s tactical deficiencies were just a few issues that City faced last season, leading to the 11-point difference between the two Manchester clubs. However, change began at the start of last season, when City presented Ferran Soriano as their chief executive officer. Soriano, a former vice-president at FC Barcelona, was a key component to the Catalan side securing a sponsorship deal with Unicef, and the appointment of Pep Guardiola in 2008. A few months later, Txiki Begiristain was given the role as director of football. Now both men that joined Barcelona in 2003 with former club president Joan Laporta, had teamed up to begin a new challenge in Manchester. Prior to their arrival, Barcelona were on a four-year trophy drought, and went 11 years without claiming a European Cup – yet during their time with the Catalan club, Barcelona won two Champions League crowns and four league titles. Begiristain, who is now responsible for player recruitment, was keen on bringing Pep Guardiola to the Ethiad this season, but Guardiola decided to move to Germany to take over as Bayern Munich manager. 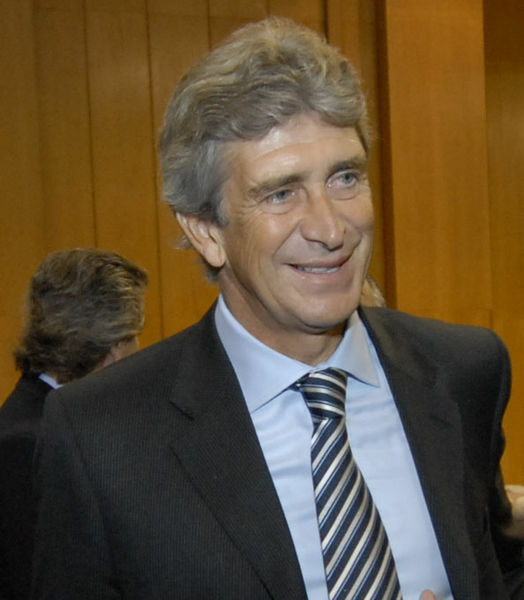 With Mancini losing the plot, Begiristain and Soriano were in need of a manager, and set their eyes on hiring Chilean manager, Manuel Pellegrini. “What we are asking the new manager to do is build a squad but also a football concept and a way of working that will last for the next 10 years,” Soriano said. “We want a manager who knows about football but we want somebody who knows about man-management. It is impossible for us to win the Champions League if we don’t have a group that behaves like a family,” he said. 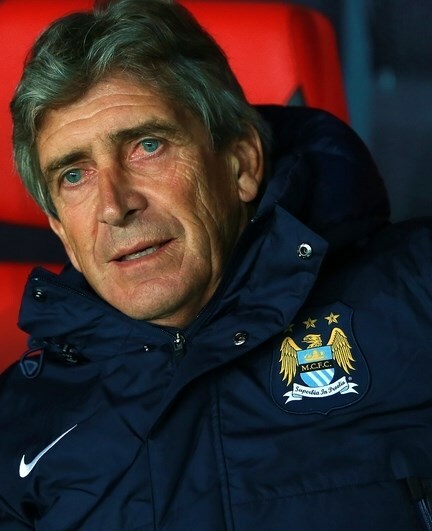 Unlike Mancini, Pellegrini is a manager that has displayed his tactical proficiency domestically and in Europe. The Chilean was provided with limited amount of talent, which led to his cautious approach in Europe – solely based on tactical discipline, organized defending and calculated attacks. The Chilean guided Villareal to the semi-finals of the 2005/2006 Champions League, while his former side Malaga was seconds away from reaching last year’s semi-finals, making Pellegrini the first manager to guide two debutants to the Champions League quarter-finals stage. With Guardiola unavailable, Pellegrini was an ideal choice for City – a manager that’s tactically flexible but also experienced with building projects and creating an identity, which is what City’s lacked during Mancini’s tenure. European experience was also beneficial in City’s decision, but also Pellegrini’s ability to build his side around his playmakers – doing so with Juan Roman Riquelme, Santi Cazorla and most recently Isco – that being vital with David Silva in the side. Begiristain and Soriano were also keen on getting rid of the ‘bad seeds’ at the club, which led to the sales of strikers Mario Balotelli and Carlos Tevez for a combined fee of approximately £27m. Although Balotelli and Tevez achieved periods of success during their time at the Ethiad, their off-field issues were beginning to taint the clubs image. City made no profit off either sale, leaving many to classify the deals as another failure by the City board, yet City indicated the sales had nothing to do with making a profit. “I was worried about the image we were giving to the world,” Soriano said. “What we want is not the image of unity, we want the unity – with the new manager, we are asking him that the dressing room has as much harmony as possible, knowing total harmony is impossible,” he said. With City selling two of their four strikers, and still needing a few reinforcements, there was no surprise to see Pellegrini bolster the squad. Thus far, City has acquired Sevilla duo Alvaro Negredo and Jesus Navas, Fernandinho and Fiorentina attacker Stevan Jovetic. Last season, City formed a formidable backline that conceded a league best 34 goals – but only Everton scored fewer goals than City of the Premier League’s top eight sides, which is a poor feat, mainly for a club that aspires league success. It was evident that City needed to improve their attacking options, and it began with the arrival of Fernandinho – a player that has been often overlooked by the Brazilian national team, but has thrived at Shakhtar Donetsk. The 28-year-old midfielder is arguably a better Ramires, who has the ability to break up play, but also burst forward into attack with his energetic runs from midfield. According to whoscored.com, Fernandinho averaged a Champions League high, 3.9 dribbles per game, which highlights his explosive runs from midfield. Fernandinho’s talent is undeniable, providing much needed depth in midfield for City, and Pellegrini will be eager to build a partnership with Yaya Toure that offers a tactical balance. Jesus Navas is potentially the direct element of attack that City lacked last season, despite signing Scott Sinclair. Navas’ will to stretch the game with his width and take on defenders is a positive, considering Mancini chose not to play with a direct winger. Although Navas’ statistics from last season are underwhelming, the Spaniard has showcased his talent for the national team, often coming on in the second half to provide pace and quality crosses into the box. Navas was in the La Liga Top 10 for key passes, averaging 2.1 a game, yet it’s not certain as to whether Pellegrini will use direct winger or instruct his wingers to drift into midfield like he did at Malaga. Nonetheless, Begiristain believes that Navas is a player that provides City with an additional element going forward . “He is an absolute gift for us. He goes past people and stretches teams. He will give us something we don’t have,” Begiristain said. City’s final two acquisitions were ideal replacements for the departed Balotelli and Tevez. Negredo, like Navas, has a few doubters to silence, despite scoring 25 league goals last season – taking his tally to 59 goals in the last three seasons. Even though Negredo was one of the top goalscorers in Europe last season, many have been quick to highlight the Spaniard’s woeful clear-cut chances rate highlighted by whoscored.com – the striker led Europe with 29 missed-clear cut chances. Although Negredo is unlikely to walk straight into the starting lineup, it’s a stat that could affect City in the future. Mainly, Negredo’s work-rate, ability to link with the midfield and converting his chances will be the decisive factor, on his road to silence the doubters. Jovetic’s arrival to the Ethiad provides City with versatility as the 23-year-old can play as a striker, a second striker or on either flank. 27 goals in the last two seasons is a remarkable feat, considering the Montenegrin was sidelined for the entire 2010/2011 season with an anterior ligament injury. Jovetic’s ability to use both feet, play in multiple systems and his eye for goal showcases why he’s an asset to City’s attack, while his desire to win trophies in Manchester is also beneficial. Once again, City has spent approximately £90m on these four men, but unlike the past, this quartet is eager to win trophies and eventually become world-class players. Although these are not the flashiest of signings, Pellegrini has shown in the past that he can get the best out of his players. With the Premier League in transition, these purchases, along with the arrival of Pellegrini have vastly improved City’s squad. Pellegrini’s ability to adapt to the league and implement an identity will be vital – yet 12 months later, City look equipped to rise to the occasion, as they’re finally assembling a team.